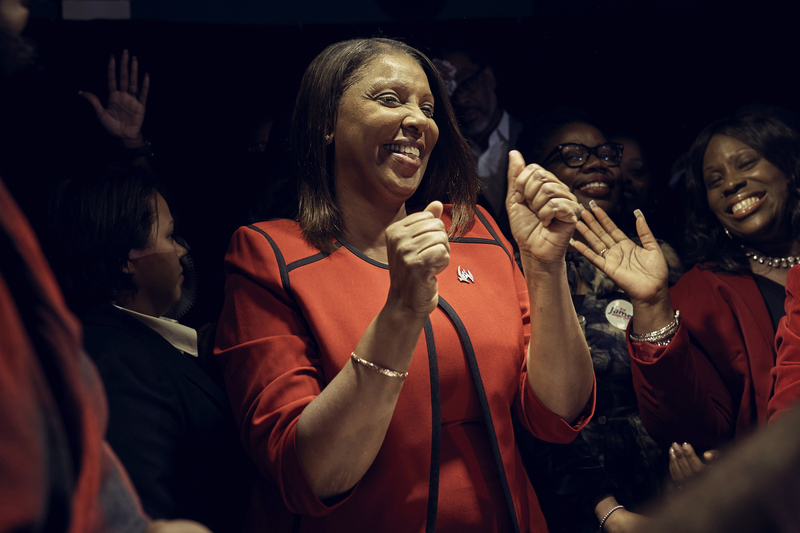 Democratic New York Attorney General-elect Letitia James celebrates her victory during an election night party in Brooklyn, N.Y., on Nov. 6, 2018. The past 48 hours have been a complete whirlwind. Not only did our nation just elect 435 members of the House of Representatives â€” including so many historic firsts â€” with Democrats seizing back a strong majority, but also dozens of important governorships and Senate seats were up for grabs from coast to coast. Those stories, rightly so, dominated the headlines. Then, on Wednesday, President Donald Trump fired Attorney General Jeff Sessions. And then we had news of another horrific mass shooting, this time in Southern California. Yet amid all these stories â€” and the controversies that surrounded them â€” many other very good stories of important election victories from Tuesday were overlooked. Itâ€™s shocking to say this in 2018, but this is the first time most of these states have ever had an African-American man or woman serve as their stateâ€™s top law enforcement official. Four that immediately come to mind took place in Nevada, Illinois, Minnesota, and New York, where progressive black candidates each ran for and won their races to be the attorneys general of their respective states. I dug around for hours to confirm that this had never happened before, and I donâ€™t believe the United States has even ever had four African-Americans simultaneously serve in this position at the same time across the country. Itâ€™s shocking to say this in 2018, but this is the first time most of these states have ever had an African-AmericanÂ person serve as their stateâ€™s top law enforcement official. Aaron Ford, a former high school teacher turned lawyer with a Ph.D. in education, narrowly edged out his Republican opponent in Nevada. Ford previously served as the minority leader in the Nevada state Senate and then became the majority leader after Democrats took control in 2016. Kwame Raoul, like most Democrats running for statewide office in Illinois this year, defeated his Republican opponent by double digits. Rauol, born in the United States to Haitian immigrants, is widely known in the state for taking over the state Senate seat that was vacated by Barack Obama back in 2004, when the future president was first elected to the U.S. Senate. Former Rep. Keith Ellison, D-Minn., won a tough race for attorney general in Minnesota â€” also marking a sweep for Democrats running for statewide office there. Ellison was once considered a shoo-in for the role, but ended up being nearly overtaken by allegations of domestic violence. Lastly, Tish James became the first black woman ever to win statewide office in New York with her blowout victory to become attorney general. Formerly serving as New York Cityâ€™s public advocate, James takes on her new role after the last elected attorney general resigned in disgrace over an assault scandal. While racial and cultural representation are absolutely important in politics, each of these newly elected leaders have also made strong pledges on criminal justice reform, protection of immigrant families, and much more. Furthermore, while each would likely deny that they are using the position as a political stepping stone to something else, such statewide offices are regularly used asÂ a pool from which to draw candidates for higher office. In other words, these were big wins. The post Why Itâ€™s a Big Deal That Four Black Candidates Won Their State Attorney General Races appeared first on The Intercept.